When it comes to choosing a commercial dishwasher, you may be surprised to learn you have number varieties and models to choose from! No two commercial kitchens are the same, from the number of dishes used in a day to the space you have to store a dishwasher, there are many factors and functionalities to consider. We’ve put together this quick guide to help establish the differences between commercial dishwashers. You may have noticed machines are listed as either high or low temperatures. The space you have to install a commercial dishwasher will go some way to helping you decide which is the most viable option, as well as running and initial costs. High temp dishwashers clean dishes with very hot water, usually around 71 degrees which is hot enough to sanitise dishes without the need for chemical sanitisers to be used. You do usually need to install a ‘condensate hood’ above a high temp dishwasher which extracts non-grease heat such as steam. High temp dishwashers use more power to run and the initial costs are high due to additional equipment, but long term, you will not need to purchase sanitiser to keep plates clean. Low temp dishwashers run at around 48 degrees. This makes them more economical to run and as they don’t require additional equipment, the initial costs are not quite as much as a hot temperature dishwasher. The lower temperature does not sanitise plates on its own, so you are required to add chemical sanitisers to the dishwasher to ensure your plates are clean. Make sure to purchase a sanitiser that won’t do any harm to your plates. If you are in a hard water area you may need to consider adding a water softener to your commercial dishwasher to avoid limescale build-up and keep results as effective as possible. 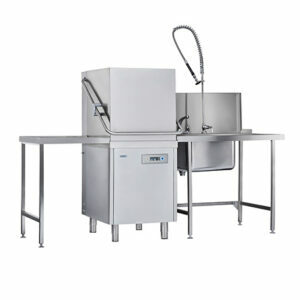 Under counter, dishwashers are probably the most popular choice for most establishments. They are perfect for commercial kitchens with minimal space, fitting perfectly under counters, unlike other varieties which require plenty of space. 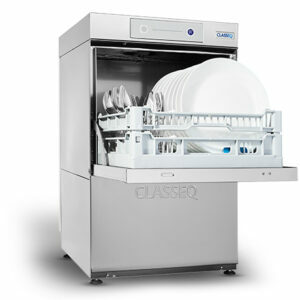 This type of dishwasher is able to manage a high quantity of plates while being easy to use, reliable and consistent. For those establishments that require a high volume of dishes to be cleaned quickly, a pass-through dishwasher may be the best solution. They can clean around 720 plates per hour, are easy to use and easy to clean. Pass-through dishwashers can be set up for corner spaces or along one side of the kitchen. The unit is stalled and supplied with two dish tables, one for dirty and one for clean dishes. Dirty dishes are placed into racks on the dirty dish table, then pushed into the washer, the door is closed and the plates are cleaned by water jets and when the cycle is complete and the door is opened, the rack of clean dishes is pushed onto the clean dish table ready to unload. Rack conveyor dishwashers are perfect for heavily used commercial kitchens and catering spaces that deal with huge volumes of covers, like hospitals and schools. This machine can clean up to 5000 plates per hour. 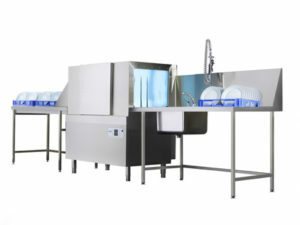 You will require a large amount of space for the dishwasher to be installed, but if you are dealing with a high level of orders, these machines are essential. They work by passing dishes through the machine on a conveyor system, a tray is loaded on one side of the machine and powerful jets remove dirt and grease, producing clean plates on the other side of the system. Commercial dishwashers are a vital member of your kitchen equipment team, they are designed to make your life as easy possible and allow your staff to concentrate on catering. If you have a question about any of your commercial kitchen equipment needs, let us know!